I had gathered an interesting collection of quick methods of blind SQL Injection exploitation, but I was lacking in a similar method for another widespread DBMS – Oracle. It induced me to conduct a small research intended for discovering analogous methods applicable to the specified database. 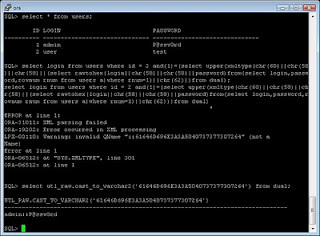 Reading one symbol per one query during Blind SQL Injection exploitation is good, but it would be light-heartedly to stop at that. We will go further. The second problem is that Oracle has no limit or offset, which doesn’t allow one to read data line-by-line easily. Finally, the third difficulty is related to the fact that the function XMLType() truncates the returned data after certain symbols, e.g. space character and the "at" sign ("@"). yes, I've already read this material. I found it through references in Jeremiah Grossman's article (here). You can also use 'extractvalue' function. >> You can also use 'extractvalue' function. Juniper JUNOS Remote Kernel Crash Flaw! WASC Threat Classification v2.0 is Out!